For the second time in three races, Japanese driver Takuma Sato will lead a 2011 IZOD INDYCAR field to green. Adapting quickly to the new 2.556 mile, 13-turn Edmonton City Airport road course, the #5 KV Racing Technology car rounded the circuit in 1 minute, 18.5165 seconds in the Firestone Fast Six final qualifying round. Delighted with the top effort, Sato commented in the post-qualifying press conference saying "It's a very special moment for me and for the team, as well. I mean, like you said, Iowa was another great moment. My first pole. To be able to do the same thing here, it means a lot." The result of Takuma Sato's first pole IZOD INDYCAR on a road circuit comes with the end of Penske Racing driver Will Power's pole streak on road courses. Winning 8 consecutive poles on street or permanent road courses on the IZOD INDYCAR Series, Power's streak ironically started last year at the Edmonton Indy race. In qualifying, Will Power made a valiant attempt to extend the consecutive pole run but came a little more than 5/100th of a second short. The Australian driver of the #12 Verizon Penske Racing Dallara-Honda will start 2nd place for the Sunday race. Though Will Power lost the first place starting streak on road courses, this 2011 Edmonton Indy start will be his 13th straight IZOD INDYCAR qualifying session the #12 car collected a front row position. Starting on the second front for Sunday's 90-lap main event, the Target/Chip Ganassi Racing cars both desire to finish one row ahead on race day to repeat their Honda Indy Toronto success two weeks ago. The New Zealand driver Scott Dixon topped the overall series points leader and teammate Dario Franchitti for the 3rd place standing spot. Along with Sato's pole-winning performance in the Edmonton Indy qualifying session, a second KV Racing Technology car collected a top-5 starting position. The #59 of EJ Viso supplied a season-best effort during the Firestone Fast Six time trial to take 5th over Penske Racing's Ryan Briscoe. The routine vanguard of the KV Racing Technology team, Tony Kanaan starts in 11th place. 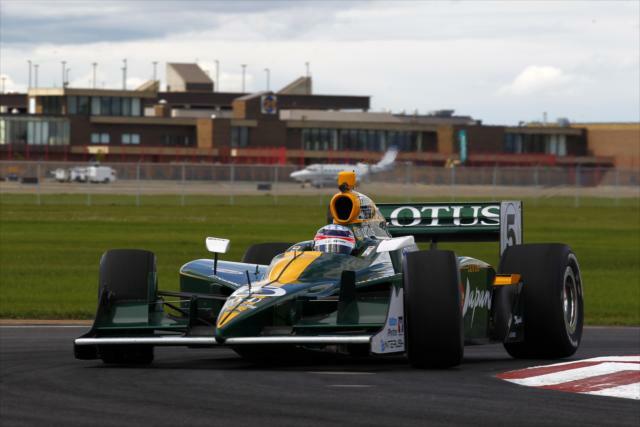 Last year with Andretti Autosport, Kanaan finished 12th on the old Edmonton City Airport circuit. This year in qualifying, Ryan Hunter-Reay will lead the four-car Andretti Autosport effort from the start of the Edmonton Indy. Qualifying 7th, Hunter-Reay starts well ahead of his teammates who struggled to come to terms with the new track. Oriol Servia, Helio Castroneves and Canadian's James Hinchcliffe round out the top-10 in the IZOD INDYCAR qualifying session. Scheduled for a 2 PM Eastern start, the Edmonton Indy will air live on Versus in the United States and TSN for Canadian television viewers.